You can't bluff your way to creating the historical elegance and period accuracy found in Old World doors. That's why you should consider the right hardware for your antique or custom door. 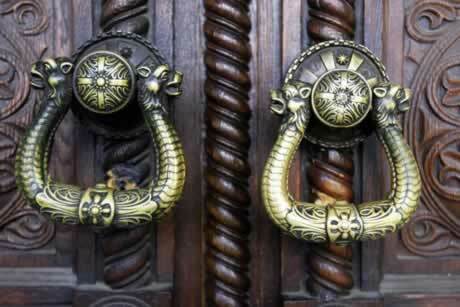 Decorative carved-wood custom doors, restorations, and antiques just won't look right without brass, cast-iron, or bronze latches, knobs, and knockers. You can even find reproduction surface bolts to secure your doors from the inside. Brass or iron mortise lock sets, strap hinges, and hand-forged clavos sets can add indisputable authenticity to your custom door. And today's modern restoration hardware offers durability and protection that historical builders could only dream about. You'll be amazed how sweating the details can change the entire effect of your custom doors and windows.